A new botnet consisting of more than 15,000 compromised servers has been used to mine various cryptocurrencies, earning its master around $25,000 per month. Mining cryptocurrencies can be a costly investment, as it requires an enormous amount of computing power, but cybercriminals have found an easy money-making solution. 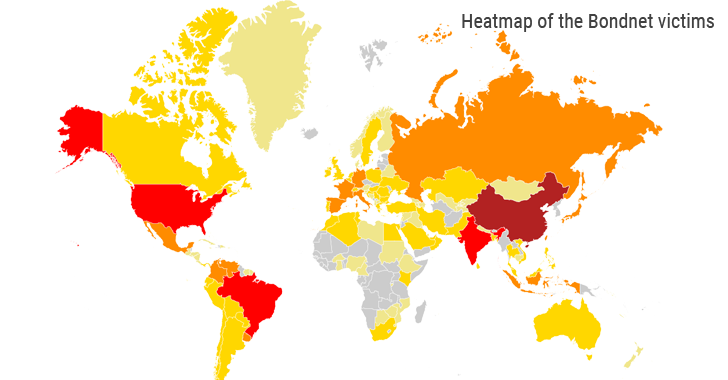 Dubbed BondNet, the botnet was first spotted in December 2016 by GuardiCore researchers, who traced back the botnet malware developer, using online handle Bond007.01, to China. 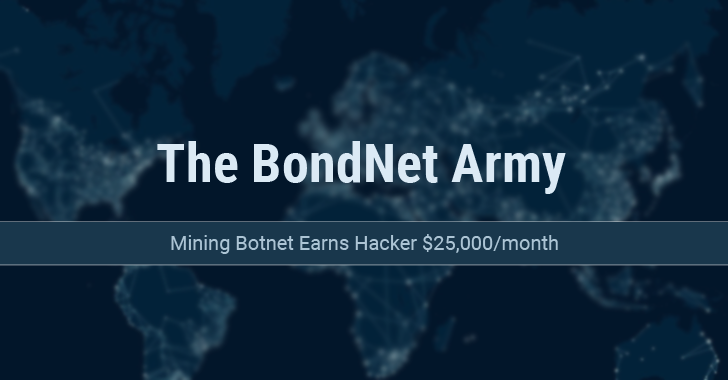 According to the GuardiCore researchers, Bond007.01 is currently using BondNet for mining cryptocurrencies — primarily Monero, but also ByteCoin, RieCoin, and ZCash — but they warn that the hacker could easily take full control of compromised servers for malicious purposes, like mounting Mirai-style DDoS attacks. Since mining cryptocurrencies require large amounts of CPU/GPU power, the botnet master goes after Windows Server machines; instead of consumer IoT devices. However, in order to compromise Windows Server machines, the botnet master relies on different attack techniques. Researchers say the hacker uses a combination of old vulnerabilities and weak user/password combinations to attack mostly old and unsupported Windows Server machines. The most common flaws exploited by the botnet operator include known phpMyAdmin configuration flaws, exploits in JBoss, and bugs in Oracle Web Application Testing Suite, MSSQL servers, ElasticSearch, Apache Tomcat, Oracle Weblogic, and other services. Once the hacker gain access to a Windows Server machine, he deploys Visual Basic files to gather information about the infected system and then install a Remote Access Trojan (RAT) and a cryptocurrency miner to make a huge profit from the hacked servers. 1. Some infected machines serve as scanning servers to check for vulnerable systems on the Internet by going through a list of IP addresses with open ports that have been compiled with the WinEggDrop TCP port scanner. 2. Some servers are used as file servers to host the mining software. 3. Other infected servers are turned into command-and-control (C&C) servers after they have been equipped with a fork of goup — a small open source HTTP server written in Golang. 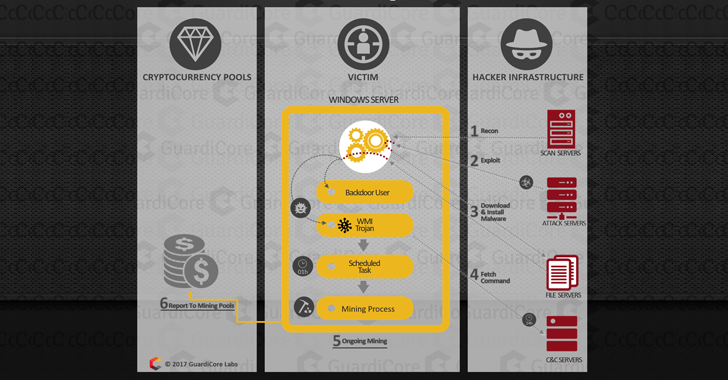 "Building an attack infrastructure on top of victim machines helps conceal the attacker’s true identity and origin of the attack," the GuardiCore researchers explained in their report published Thursday. "It also provides high availability infrastructure, which is very helpful when relying on compromised servers, providing infinite backup options in case one of the servers fails or loses connectivity to the internet." BondNet has already infected more than 15,000 server machines at major institutions around the world, including high-profile global companies, universities, and city councils, while the majority of them runs Windows Server 2008 R2. Additionally, the BondNet botnet adds around 500 new machines to its network each day, and an approximately the same number of servers are delisted. To prevent your machines from getting hacked, server admins are advised to secure their systems by regularly applying security patches for all software, updating the firmware, and employing stronger passwords. Meanwhile, GuardiCore has also provided network and file indicators of compromise systems to help server administrators check whether their machines are among compromised ones. The researchers have also released a detection & cleanup tool (registration is required to download it) to help admins find and remove BondNet bots from their servers, as well as instructions on how to clean the system manually, without using the script.